Theodor Seuss Geisel, more commonly known under his pen name, Dr. Seuss, was a champion of reading for all ages. His works are favorites of generations and continue to inspire those both young and old. In honor of this great literary mind, celebrate his birthday on March 2 with a day full of fun! 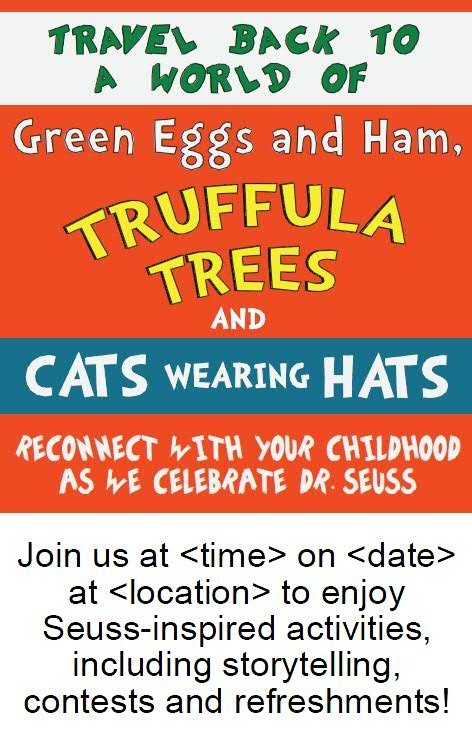 Seuss’ birthday is recognized as National Read Across America Day, making it a perfect occasion to market your trade books, and connect students to some of their favorite childhood stories. Highlight some of your faculty members' favorite Seuss books on posters in your store as well as on your social media sites. 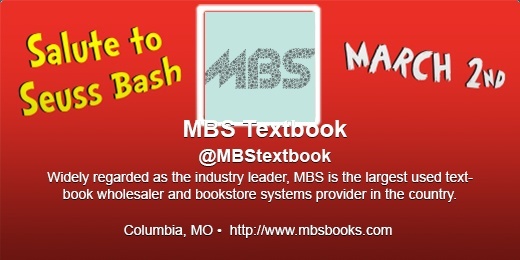 You can further promote the titles by offering discounts to encourage in-store purchases. Aim for one faculty favorite each day of the week leading up to the celebration. Use our easy templates to get started. Simply download our questionnaire and attach it to an email to your faculty members, asking those who are interested to send a completed version back to your store by a designated date. Then, customize our Faculty Favorites poster template (below) with each individual's responses in your favorite graphic design program, such as In Design. Select passages from some classic Seuss books and post them to your Facebook page, asking what book the quote is from or another question a fan could answer. Give away prizes to the first person to answer the question correctly. In what Seuss book will you find the following passage? First person to answer wins the book of the same title! --What is your favorite Dr. Seuss book? 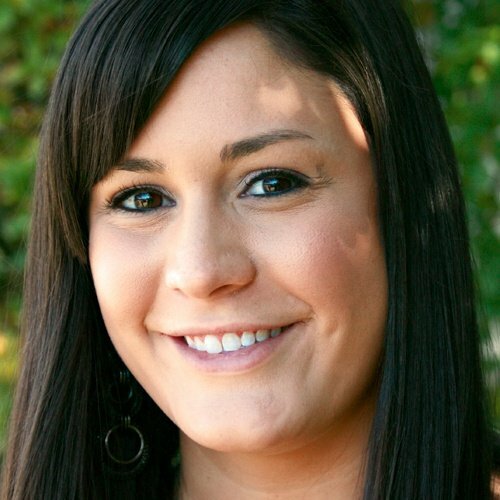 --If you could be any Dr. Seuss character, who would you chose? --What is your favorite quote by Dr. Seuss? The works of Dr. Seuss are filled with alliteration, which lends handily to a tongue twister read-off competition. Choose a few of the trickier passages and pit contestants against each other. The fastest reader wins a prize! Tip: Seuss’ book Fox in Socks is written entirely in tongue-twisters, and is a great source of material for this activity. 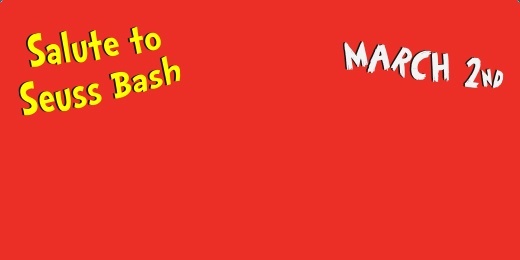 Create a photo booth filled with props from some of the iconic Seuss characters. For example, you could provide the stove pipe hat from Cat in the Hat, a bright orange mustache from The Lorax, or even Thing 1 and Thing 2 costumes so that students can grab some props and pose for a picture! Upload the photos to Facebook and encourage everyone to tag the photos and share them with their friends. Invite faculty members who participated in the Faculty Favorites book promotion to read passages of their favorite Seuss classic aloud during the birthday celebration. Tip: Record the readings and post the videos to your YouTube channel or Facebook page for those who are unable to attend. Invite families from your community or even classrooms of children from a local elementary school into your store for an hour or two of story time. Create a fun atmosphere with Seuss-themed costumes and activities for the children. Also consider providing refreshments, such as cake and punch, to make the birthday celebration complete. 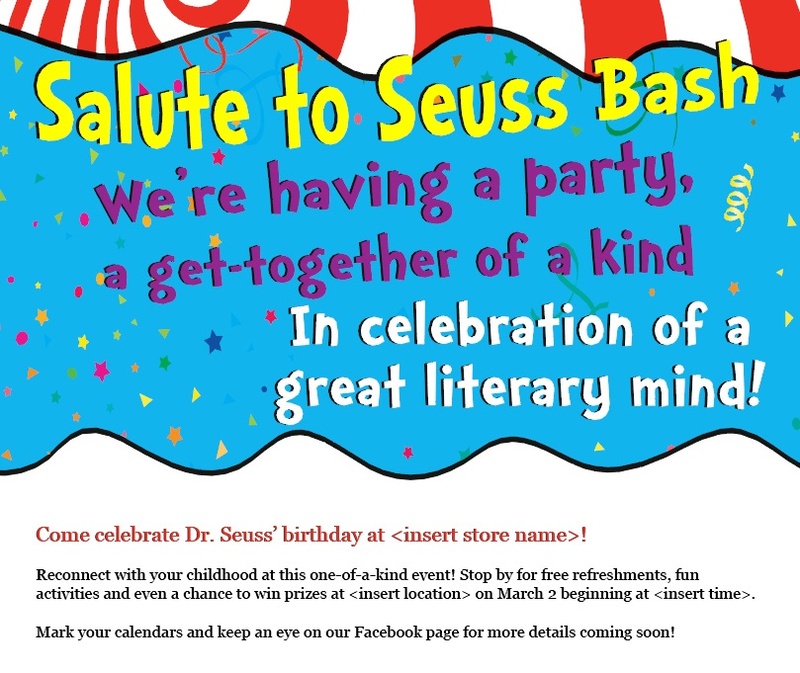 Once you've planned the different events your store wants to host, announce the Salute to Seuss Bash to your customers. We have provided everything you'll need to get people excited, including a customizable poster template, Facebook Cover Photo, Twitter Header image and background, as well as a customizable email template. Before the celebration begins, use these resources to communicate with your customers about the big day and the events that will be taking place. This week's goal is to promote reading and celebrate Dr. Seuss, so have fun with the plan and be as creative as you would like!